If you are unable to stay with your baby and take care of him, then you can look out for help from someone else. • Ask your parents or in laws or a family member to move in with you and take care of your baby till you make an alternate arrangement during emergency situations. Go out carefree as your baby is in safe hands. • Look for a nanny. If she is not around for a day, how about swapping your neighbor's nanny or caregiver? Pros- Affordable, reliable, ample supervision and personalized attention. Cons- Kids fall sick often if the caregiver is sick and there is no supervision of the nanny. If your child is unwell and you have no one to pitch in to help you, do not worry! Who can take care of your baby better than you? • If you have enough sick leaves or personal leaves in your account, how about taking a day off? Do not think twice about leaves as your priorities have changed now. • Ask for the option of working from home if you have an option to do the same. 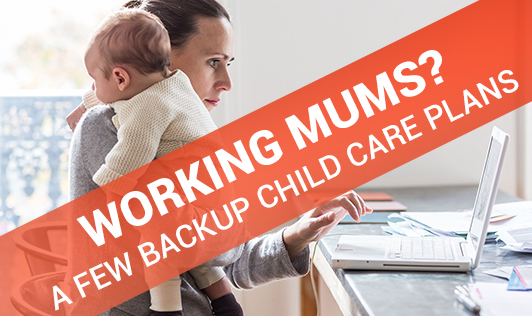 You can still take care of your younger one while working. • If your child is taking a few days to recover, take turns with your partner for taking leaves or to work from home. Pros -Best care for the baby and a balanced work-family relationship can influence the child's developmental milestones. Cons- Professional compromises and physical and emotional stress.